We are living in the 6th Mass Extinction of species. Australia has the world’s worst record for mammal extinctions. Here is one more example of why the list of extinct species is growing – governments are failing to adequately protect the environment. In their nightly foraging, flying foxes fly from tree to tree, dusted with flower pollen or eject the seeds of fruit eaten, inadvertently regenerating woodlands and forests by dispersing up to 60,000 seeds each every night. Many eucalypts produce most of their nectar at night to attract these exceptional pollinators. Flying about 20-50 km a night between food trees and their camp, this keystone species maintain the genetic diversity of native trees and reforest gaps. This ecosystem service will become increasingly important to facilitate the flow of adaptive genes between trees, assist plant movement and assist the survival of many other species. As a keystone species already in decline and vulnerable to extinction, the protection of flying foxes is tantamount. If flying foxes become extinct we are doomed. Without flying foxes we would have no more forests including World Heritage forests and hardwood forests, melaleucas, banksias, eucalypts and about 1/3rd of all fruit that relies on flying foxes to pollinate them (bananas, cashews, avocados, dates, mangoes, peaches, paw paw, durian). Scientists regard the loss of pollinators as the most serious issue facing mankind.1. The Bateman’s Bay population of grey-headed flying foxes (GHFF) is a Matter of National Environmental Significance (MNES) i.e. there has been a population of at least 10,000 every year for 10 consecutive years. But now there are over 100,000 flying foxes at Bateman’s Bay. There are estimated to be 680,000 GHFF total. In the 2009 Recovery Plan it was noted that shooting flying foxes had diminished due to subsidies by NSW government for netting. However habitat loss is increasing and there is lack of food. 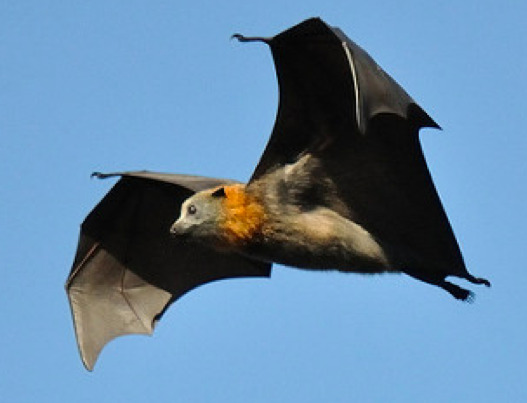 For example extensive clearing on the coast for agriculture results in flying foxes losing weight, having higher mortality and lower reproduction levels. Their populations are not bouncing back. They are suffering ongoing deterioration in condition as they explore new areas e.g. inland Adelaide and Wagga Wagga. Due to food shortages they are forced to eat marginal food such as privet and green figs and are establishing satellite sites a distance from their camp. Grey-headed Flying Foxes are protected by the National Parks & Wildlife Act, 1974, Threatened Species Conservation Act, 1995, Environmental Protection & Biodiversity Conservation Act, 1999 and the International Union for the Conservation of Nature – Red List of Threatened Species. Already flying fox populations are impacted by heatstress from very hot weather (>38 degrees C), droughts, cyclones, bushfire. They don’t need the additional threat of dispersal at a time when they are starving from lack of food sources. Why create an exception just because local residents are unwilling to live in harmony with them? If dispersal is approved, it is likely to set a dangerous precedent for people in other locations to demand dispersal of flying foxes in their area too. •	As a species vulnerable to extinction in the next 25-100 years, dispersal risks their long-term survival. In fact 30% of the species died between 1989 – 1998 due to dispersals and since then their decline has been accelerated precisely due to dispersals and relocations. •	As a keystone species whose survival is required by many other species of plants and animals, their extinction would have far-reaching and devastating consequences for the entire Eurobodalla area, not just Bateman’s Bay. FLYING FOXES COULD BECOME PERMANENT FUGITIVES AS THEY GO FROM PLACE TO PLACE, EXHAUSTED, STARVING, STRESSED, MOVED ON BY HUMANS WHOSE NEEDS ARE JUDGED MORE IMPORTANT THAN THE NEEDS OF A SPECIES ON THE TIPPING POINT OF EXTINCTION. THIS SITUATION WILL WORSTEN AS TIME GOES ON WITH INCREASING HABITAT LOSS DUE TO HUMAN OVERPOPULATION AND ENCROACHMENT INTO THEIR HABITAT. a) The irreplaceable ecosystem services of flying foxes i.e. pollination of native trees (including World Heritage forests, hardwood forests, banksias, melaleucas, eucalypts etc) in the area. Flying foxes are the #1 pollinator of forests, who on their nightly foraging increase the genetic strength of plants, preventing inbreeding. Without flying foxes we would have no avocadoes, bananas, durian, cashews, dates, mangoes, peaches or paw paw. And without forests we would have less oxygen in our atmosphere. b) Fears of disease from GHFFs must also be allayed since bats have no more diseases than any other wild animal and diseases like Lyssavirus and rabies cannot be contracted except via body fluids. It is not possible for humans to contract Hendra virus directly from flying foxes, only via infected horses. c) A comprehensive education/advertising program must be undertaken to eradicate the common perception of bats as ‘pests’ to be culled or relocated. This should ideally include TV advertisements, articles and radio interviews so that Australians across the country become educated. Wildlife carers could be paid to take orphaned bats to schools so children can see how adorable they are and the reasons why they need our protection. I cannot overemphasise the importance of education as Australians commonly have an attitude that native animals (not just flying foxes) are ‘pests’. The prevailing public hysteria around bats needs to be defused urgently and that includes dealing with residents’ irrational fear of disease and the importance of wildlife-friendly netting for fruit trees. 2) Big Picture Explanation - Secondly, residents need to understand the reason why there are so many bats at Bateman’s Bay ie. we humans have taken away their habitat and therefore are now paying the price. * Double-glaze windows to cut down on noise. * Park cars under cover. * Place washing lines in the open away from trees and night-time flight paths. It’s by far easier to adapt human behaviour to bats, than the other way around. 4) Repercussions - People need to seriously consider the adverse effects of no forests or native trees. What kind of future will there be for our children and grandchildren? How will they cope with less availability of certain fruits, less oxygen and more Co2 in the atmosphere from no forests? 5) Tourism Opportunities - Eco-tourism needs to be promoted so local businesses can flourish and benefit from the amazing spectacle of thousands of bats leaving their camp at sunset. This would help locals to appreciate bats for the increased tourism to their shire. Flying foxes have so many gifts to offer us if only we could get beyond the mental fixation that they are a nuisance. 6) Business Opportunities - Perhaps some enterprising person can start a business selling organic bat manure which is bound to be highly beneficial to gardens. 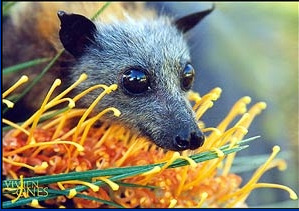 7) Improved gardens - Local residents can benefit from free fertiliser per compliments of the flying foxes. Some residents say gardening is impossible but bats aren’t flying around in the day. Perhaps those residents should try gardening in the daytime and not after sunset and pre-dawn when the bats are most active. While all these ideas cost council money, the bottom line is they cost a lot less than dispersal without the disastrous impacts on threatened keystone species. 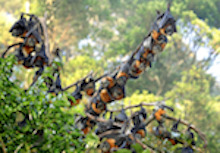 •	create alternative flying fox roosting locations that include native food trees so that flying foxes don’t rely on orchards and therefore impinge upon humans. Non-residential urban areas such as parklands, golf courses and even cemeteries can be planted with a range of native trees that provide fruit (small-leaved figs) and nectar (eucalypts and melaleucas). This would provide feeding sites away from residential areas and corridors for them to travel between remnant forests. If these natural food sources are available when commercial fruit trees are bearing fruit, flying foxes are less likely to become a problem. •	a camp may be encouraged to move (which is not the same as forced relocation) and can be done by planting roost trees further away from houses. Surveys of flying-fox camps in New South Wales have shown that a distance of as little as 100 metres from neighbouring houses can be enough to reduce the noise level of a flying-fox camp to an acceptable level. •	Remove the lower branches of trees and clearing the understorey, to create a buffer between roosting animals and surrounding residents. Such actions would need to be undertaken carefully, preferably in conjunction with the creation of suitable habitat elsewhere, and subject to a monitoring program. Further research needs to be done into the factors influencing the establishment and persistence of flying fox camps.2. •	Low, dense trees and shrubs planted around fence lines also form a barrier that flying-foxes are unlikely to roost in3. •	Incorporate a buffer zone between the building and roost trees that ideally should not be paved or made of concrete in order to reduce mess problems. Plant low growing fragrant shrubs in this zone to minimise future encroachment by the animals into the site and reduce odour problems. Planting tall trees will only eventually bring the animals closer in to the development. •	Worst case scenario if everything else fails, dangle electric wire from the trees which the bats touch and it gives them a small electric shock, and then they go away. While it's only a small shock, still it's better than being killed. 10) All About Timing - The camp will reduce in size in the next few weeks or months so people could wait patiently, most of the flying foxes will leave when the flowering season of spotted gum, red bloodwood, and blackbutt begins to decline. Or at the very least wait till early February when juveniles will be independent, recommended by Ecologic Australia. Success is more likely if dispersal takes place when the camp is smaller and outside bats’ sensitive life cycles. 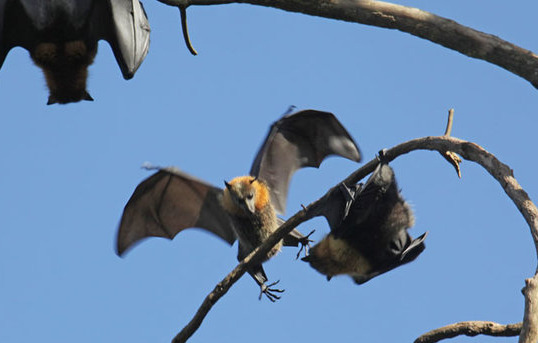 All affected residents at Batemans Bay moved into their houses knowing full-well that flying foxes lived nearby since they have had at least 10,000 flying foxes per year for the last ten years. It is reasonable to expect that the flying foxes would breed and expand their population (as with human populations). For governments to bend over backwards and break important rules and regulations that are in place to protect our environment and especially threatened species to appease people who lack the tolerance, compassion and understanding of bats is a grave error, one that we will pay for long into the future should the bats become extinct. The Threatened Species Conservation Society Inc. sincerely hopes that the Eurobodalla council and the Federal Government will at least try a bit harder to solve this problem instead of going down the route of dispersal which is guaranteed to fail and be hugely expensive, for the sake of our little forest-makers. Conflict between flying foxes and humans in our shire is so disconcerting. Humans have destroyed 75% of pre-colonial forests for logging, mining, livestock grazing, industries, cities and housing. We continue to take from the land whatever resources we need to make ourselves comfortable (computers, TVs, cars, refrigerators, mobile phones, iPads etc). But when the flying foxes are too close to our schools and homes, screeching and squabbling all day with a smell we dislike, we scream ‘they have to go’! But where? We have taken away their habitat, their food sources and now they are becoming permanent fugitives as they go from place to place, exhausted, starving, stressed, moved on by humans whose needs are judged more important than the needs of a species on the tipping point of extinction. This situation will worsten as time goes on with increasing habitat loss due to human overpopulation and encroachment onto their land. Flying fox populations have declined 95% in the last century and 30% since 1988 and are vulnerable to extinction. Their ecosystem services of night-time pollination is without compare. Every night they fly up to 50km dispersing approximately 60,000 seeds each. What does it mean if they become extinct? Simply this – no more World Heritage forests, hardwood forests, melaleucas, banksias, eucalypts and about a third of all fruit (including bananas, avocadoes, mangoes, peaches, pawpaw, cashews). And fewer trees mean less oxygen to breathe. Our preoccupation with creature comforts is trivial in comparison. Shouldn’t we be incredibly grateful to this keystone species whose existence is critically important for so many other species including ourselves? Shouldn’t we be a bit more tolerant? From a bat’s perspective we are the ones who are stinky, filthy, noisy pests! They are not the one with outrageously loud ‘music’ festivals and doof music blaring from their noisy cars and radios! They are not the one brushcutting, mowing on tractors, bulldozers and earthmoving equipment tearing up our habitat! Nor are they the ones stinking up the environment with their cigarettes, chemical sprays, chimney smoke and hazard reduction burns! 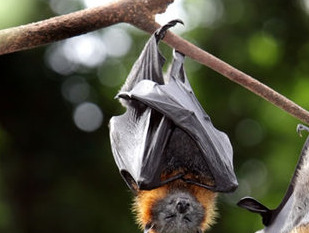 Flying foxes are not pouring their feces and cow sewage into the ocean. No, it is us who are the pests. Additionally they are native whereas we are ferals having just arrived in this land 230 years ago. Humans have had it good for too long. If we can’t live in harmony with other species in an ecocentric vs anthropocentric way, we too will head for extinction. If aliens were watching us they would probably think we were the stupidest creature on the planet. Either that or that psychopaths were running the country. Thank you for this much needed comprehensive article and the great illustrations. I particularly like the last one of the sleeping bat.